In October we took the boys on their first flight down to Sydney for a few days. 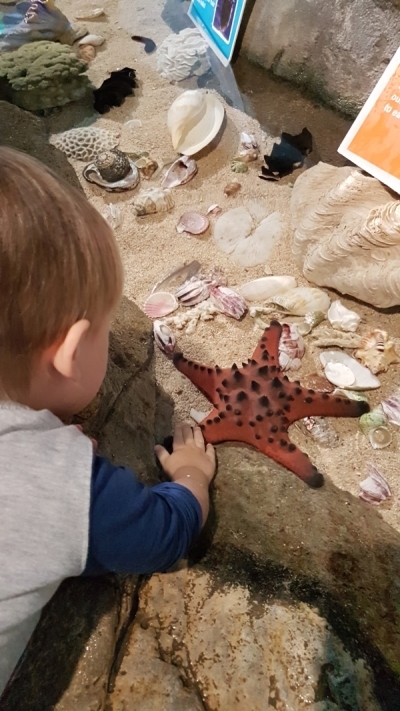 I'm sharing what we did and things to see in Sydney if you're travelling with toddlers. If you want to skip that, I've included my regular outfits too. Toddler T is 3, and Baby Boy is 19 months. Both are good walkers. We took a travel stroller and I had my Ergobaby carrier. The stroller was great for carrying the baby bag, layers to wear and food and snacks for the boys but we didn't think Sydney was very stroller friendly. Sydney had daylight savings time but it was only an hour different from Brisbane so we stuck to Brisbane time as normal. I was looking forward to this day the most! I didn't have a lot of space as we packed light, mostly taking extra clothes for the boys. 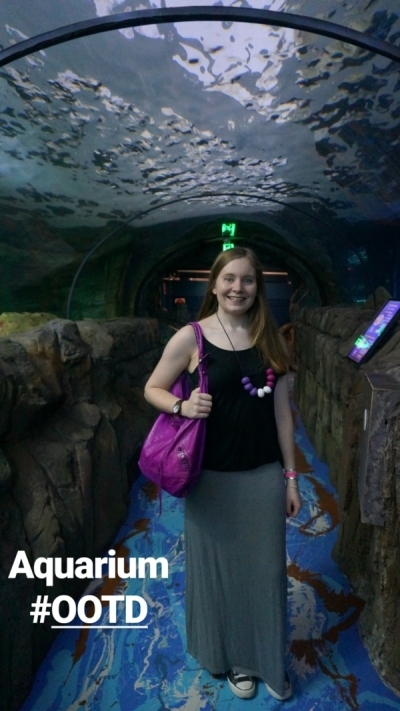 I still prioritised so while I wore the same Converse every day, I had room for a change of bag and instead of my Louis Vuitton speedy bandouliere I swapped out to this magenta Balenciaga day bag for our morning at the aquarium and spending the afternoon with my bestie. She has a magenta Balenciaga bag too so I had to wear this for the occasion! Did wish I'd packed another jacket, as it was an overcast and colder day and this purple cardigan was the warmest piece I'd packed. 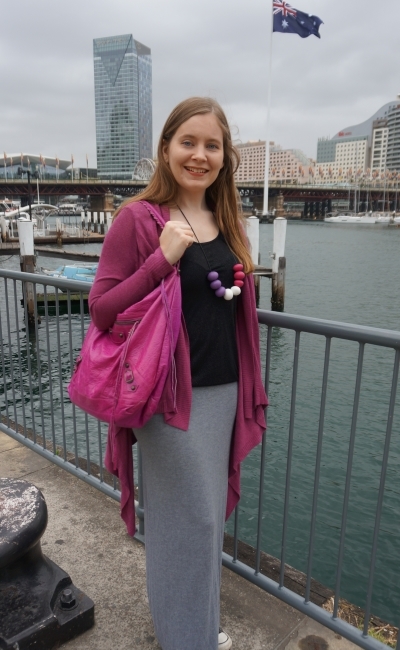 Last worn: purple cardigan, black tank, grey jersey maxi skirt, Converse, Balenciaga magenta day bag. Other ways to wear: purple cardigan and chambray dress, black tank and printed shorts, grey jersey maxi skirt in monochrome outfit, Converse and printed dresses, Balenciaga magenta day bag with button up breastfeeding dresses. Perfect for pregnancy: black tank in first trimester, maxi skirt for second trimester travel, magenta Balenciaga and maternity denim. We landed in Sydney in the afternoon, and it was off to where we were staying for nap time. I will not be sharing the name of the place we stayed as it was the worst place I have ever stayed and if there had been other options available I would have demanded a refund and moved out. After failed nap time for Toddler T, I took him with me on my bloggy date with Rachel from a Nesting Nomad. It was great to catch up with her again, after meeting her in Brisbane a while back. I followed Google Maps but failed to realise the route resulted in walking up a very long hill to get to the meeting point. Only slightly late. Sorry again Rachel! We walked through Hyde Park to let Toddler T run around a bit, then met up with Hubby and Baby Boy once he'd woken up. We went for a walk around Paddy's markets and through Chinatown before going to Darling Harbour. 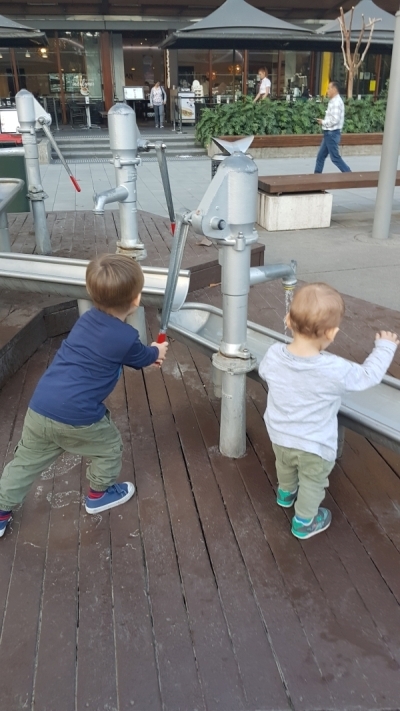 Tip: Darling Harbour playground is perfect for toddlers. The boys had the chance to run around and play to expend some energy after sitting still on the flight. Lots of lovely restaurants nearby for dinner options too, although we went back to where we were staying and ordered takeout! A cold and dull day, it was supposed to rain so we headed to the aquarium as we suspected we might. We hadn't bought our tickets in advance, not wanting to tie ourselves down to anything much with two toddlers. Tip: Buy your aquarium ticket in advance. The line to purchase was extremely slow. The aquarium was worth the wait though, the boys loved it. Despite it being perfect indoors weather and a weekend, there was plenty of space for the boys to run around from exhibit to exhibit as it wasn't too crowded. There were roving staff members in a few rooms presenting and talking about things to see, as well as lots of helpful educational information near each tank. Made it easy to explain to the boys what they were seeing, even though they were a little young to read for themselves. Tip: Take toddlers to the bathroom before you enter. The bathrooms are at the end of the aquarium which is not what you want to discover halfway round. After the aquarium, we attempted to head over the Pyrmont bridge to get to the shopping centre for lunch. I have fond memories of walking along the bridge on holiday as a kid, back when the monorail was still there! So difficult to do with a stroller though. We'd walked past the lift a few times before we found it, and then getting the lift down into the shopping centre on the other side of the harbour involved getting out on the top floor, walking through the shopping centre, getting another lift down then walking back to go to where we wanted to eat for lunch. On our way back we just walked around the harbour in the cold rather than attempt the silly lift system again. As the boys napped, my bestie arrived and I snuck out leaving hubby and the boys to rest as we went to the Lindt Cafe for some chocolate and a catch up. It might have just been the company, but it was easily one of my favourite meals in Sydney, as we shared the 'dome of decadence' between 3 of us. Tip: Lindt Cafe might be a little too chocolate filled to be a good option with a toddler, but they do takeaway! After an amazing afternoon catching up, it was dinner time and we just headed to the nearest McDonalds for a fuss-free meal, perfect for toddlers! The day Toddler T was looking forward to most - a trip to the zoo and a ride on a Sydney Ferry! 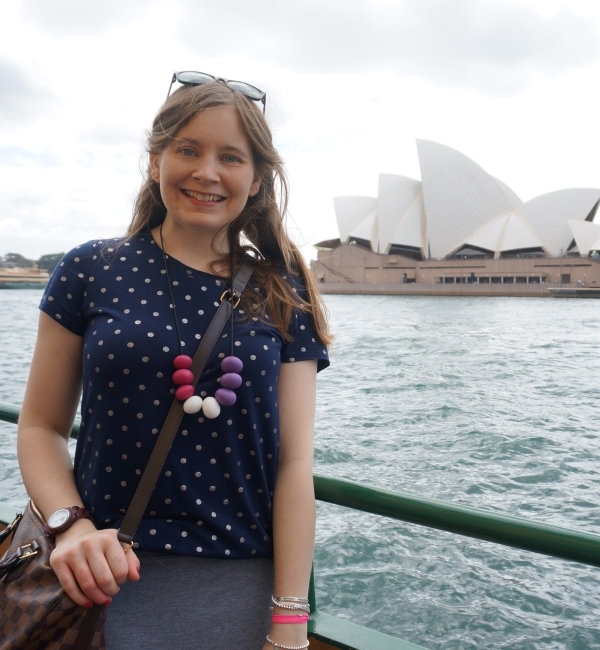 After a slight detour into the Rocks, we eventually made our way to Circular Quay and had the chance to take photos with the Opera House and Harbour Bridge. Tip: The Rocks is NOT stroller friendly, don't even try it. Or you'll end up stuck looking down on the harbour realising the only way down is a very long flight of stairs with a stroller. Thanks again Google Maps! I expected some excitement from the toddlers about the landmarks we'd been pointing out in books for weeks, but it was of course all about the boats! 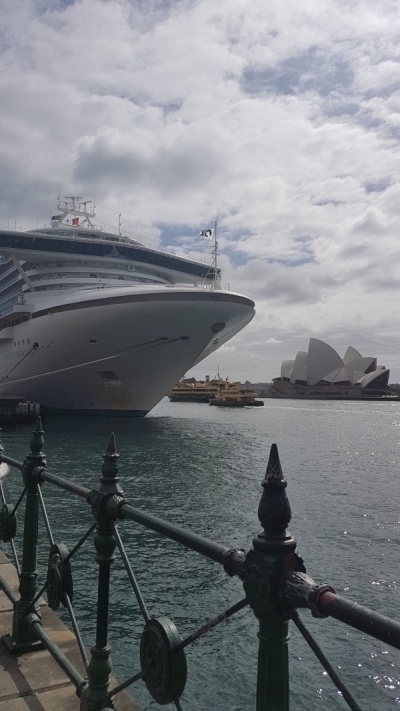 There was a big cruise liner docked while we were there which was exciting to see. 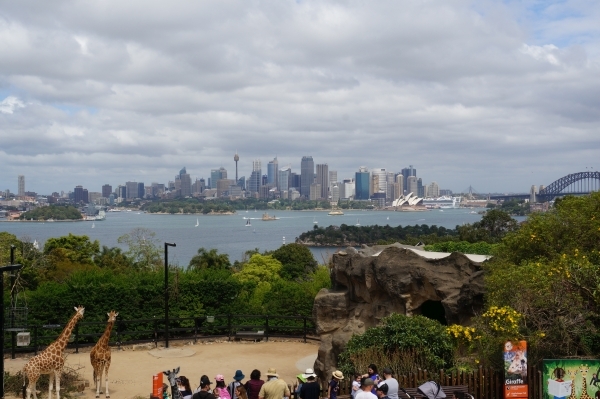 After buying our tickets we hopped on the ferry to go to Taronga Zoo. 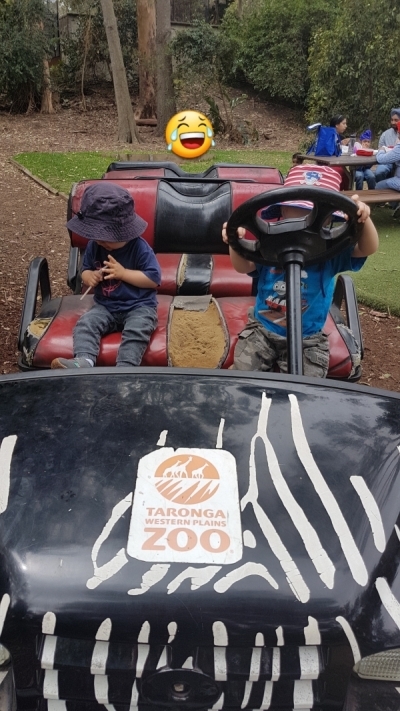 It's a short trip, just enough time for the toddlers to enjoy being on a boat and you to point out and take photos of all the landmarks before you arrive at the zoo. Tip: You don't need to travel round all of Circular Quay to get landmark photos with toddlers - just hop on the Manly ferry and take photos from the boat! When we arrived at the zoo, as we had bought our tickets in advance we were able to take the gondola up over the animals to the very top, with amazing views of the harbour. Of course it was the animals you fly over that the boys enjoyed more than the view! Tip: buy your zoo ticket in advance, even if just at the ferry terminal. It gives you the ability to take a gondola up to the top of the hill and work your way down. Starting at the top of the zoo made getting around with the stroller very easy, no need to push up any hills. 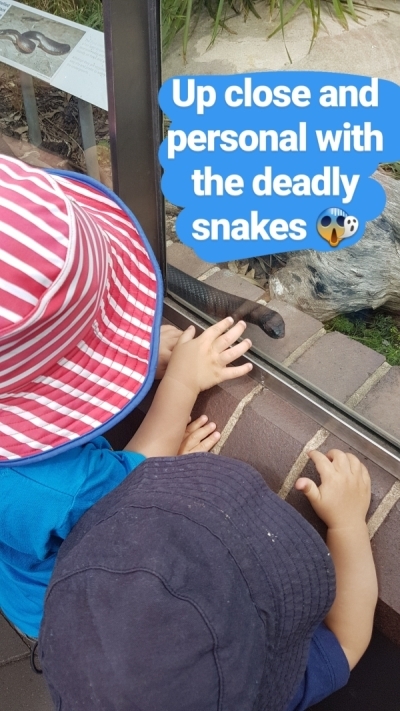 While we didn't see all the animals (we skipped the aquatic section after the aquarium the day before, and the line for the tiger experience was too long for a toddler's attention span) the boys had a great time running around and getting up close with the animals we did see. We had lunch at 'The Fish Stop' which does have non-seafood options, and was less busy than the central 'Food Market' although it does have less choices. It was so easy to get food and then sit in one of the many picnic areas right next to it, with incredible views of the Sydney city and the harbour. 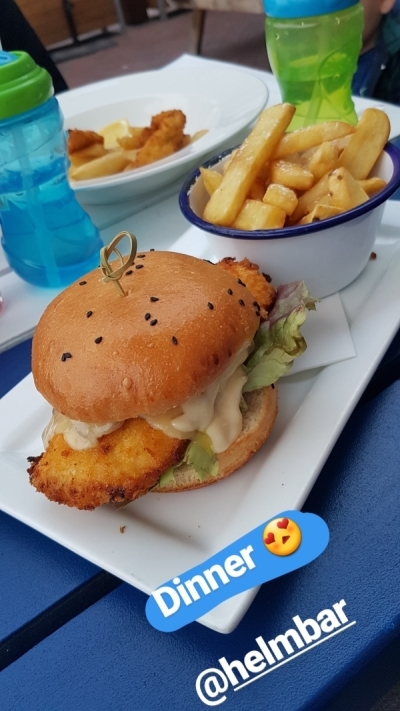 Tip: Grab a bite to eat at 'The Fish Stop' or bring a picnic and sit back on the lawns for an amazing view out over the harbour! While the monkeys were the favourite animal of the day (and it was incredible watching one of them mesmerised by my teething necklace!) there were so many to choose from. There was a lovely playground in the farm animal section. Although it was geared towards older kids the boys really enjoyed playing there for a break from animal-watching. The walk back to the ferry was a really nice downhill stretch, and while you do have to go through a gift shop as you exit the big shark tank and presentation that was on around the sharks meant the boys were nicely distracted as we left, souvenir free. If only that had been the case at the aquarium, ha! Once we got back to Sydney, we headed to Helm Bar for dinner. I'd looked up a few places online for food and Helm bar was highly recommended, but seemed like a noisy party bar every time we passed it before. Having no luck finding anywhere else open on a Sunday night in our price range, we went there as it was listed as wheelchair accessible. While there's no easy way to get a stroller up the stairs to the bar, there is a lovely beer garden you can sit in and order food and drinks. It was perfect for families. Food was so well priced, especially for Sydney, and the boys loved their kids meal. I'm still sad we tried it on the last night so I couldn't go back for another schnitzel burger - definitely will be next time I'm in Sydney! This was our travel day, we didn't do much other than pack up, prepare another lunchbox full of snacks for the plane trip home, and make our way to the airport. The toddlers can walk, and we had the stroller and Ergo Baby carrier for babywearing so there were options when the boys didn't want to walk any more. We had a general list of the sights we wanted to see but didn't buy any tickets in advance so that our days could change if necessary, and we weren't feeling rushed as we didn't try to do too much each day. One activity or outing is fine, and just wing it for the rest of the day. This works for the plane flight too, but when you're in a new place you might not know how far away the next kid-friendly place to eat is, so having snacks with you for the toddlers and yourself comes in helpful. The only regret I had in Sydney was that I didn't take a lot of photos (a few hundred over the 4 days instead of my usual couple of hundred I take a day when something exciting is going on!). Not until the boys are bigger and the stroller isn't needed - it was a real pain trying to fit the stroller in places - even though we packed a small umbrella travel stroller instead of our usual big one. Sydney definitely felt a lot more cramped and less stroller friendly than Brisbane. Unlike the outfit above, I actually found it too warm to wear the cardigan on this day and wished I hadn't brought it! We took the boys to see the Harbour Bridge and Opera House at last (our third day in Sydney...) and hopped on the Manly Ferry over to Taronga Zoo. The benefit of wearing the Ergo Baby carrier in the back carry position (you can just see Baby Boy's little foot peeking out in the pic!) is that it's easy to wear a cross body bag, and my Louis Vuitton speedy bandouliere was perfect for keeping my camera close by for walking around the zoo. 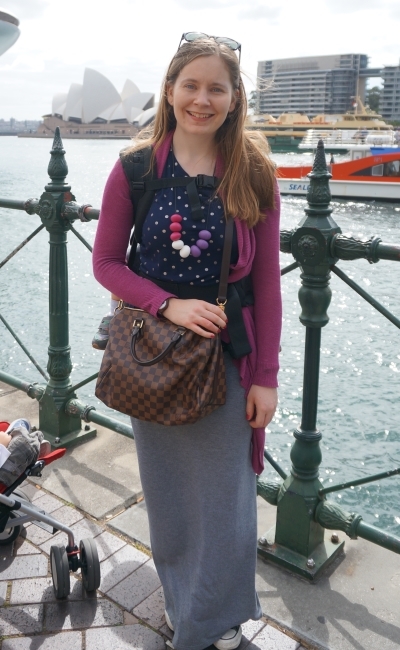 Last worn: purple cardigan (above), polka dot tee, jersey maxi skirt (above), Converse (above), Louis Vuitton speedy bandouliere bag. Other ways to wear: purple cardigan and button down tank, polka dot tee and mustard cardi, jersey maxi skirt and graphic tee, Converse and colourful jeans, Louis Vuitton speedy bandouliere bag and skinny jeans. Perfect for pregnancy: maxi skirt in third trimester, Converse in the second trimester, Louis Vuitton speedy Bandouliere and maternity denim. Linking up with Friday Faves, Style Wise, Mix It Monday, Modest Monday, Hello Monday, On Monday We Link Up, On Trend, Confident Twosday, Trend Spin, Turning Heads. Looks like you had an amazing time! Loved the look of the aquarium and the Lindt Cafe. Have a great weekend. Finally, you posted your adventure in Sydney. Had fun reading it, so good to know how you feel about this city. You've done quite a lot of activities, it's good you didn't skip the aquarium and the zoo. I find it hard too taking kids in stroller when travelling. But at least you've taken your kids here and had a fun time. Yes it was a long post so took a while to put together! :) And we did have a very fun time! Hi! It looks like you and your family had a beautiful time! The chocolate looks delish! 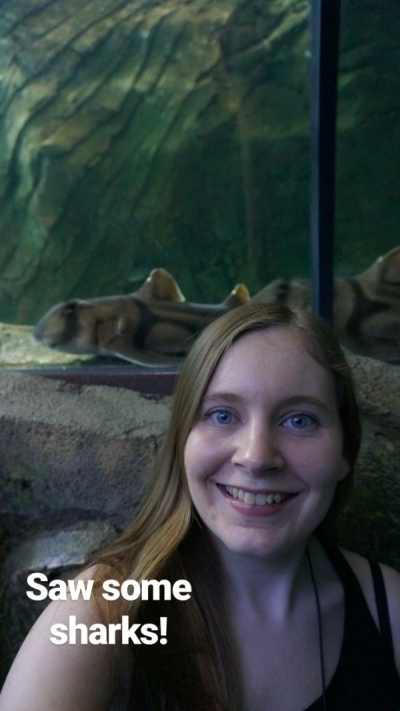 I feel the aquarium are exciting spots to visit when traveling. Sounds like your trip was awesome. There is definitely a lot to do in Sydney, I want to visit there someday. Your outfits look gorgeous my lovely! This looked like such a fun trip! You guys did a lot which I am so impressed especially with a toddler! You should! Australia is beautiful! I'd love to visit New Zealand too, never been! It looks like you all had such a great trip! It's fun seeing more of the boys and your family. The chocolate cake looks sooo good. I'd love to visit some day. What a cool trip! I've always wanted to visit Sydney but it's definitely a big trip to make it from the States. Maybe one day! I remember being in Sidney and constantly walking up and down stairs. Back then I was kids free, but now I would probably suffer as you did. Funny how things change once you have kids! Yes, you definitely look at holidays differently with kids! And stairs when you have a stroller, haha! I like your tips - I've found that it really helps for most touristy things to buy tickets in advance, if possible, otherwise you end up spending so much time in lines! If you ever come to Australia let me know - it's a great place although a long trip! Yes, I'm definitely going to buy tickets in advance next time! Sounds like such a fun time together! Maybe one day we will make it over to Australia! Oh wow! Sounded like you all had a fab time at Sydney. Thanks for sharing all these wonderful tips. Don't have a toddler anymore, but it's always good to know what places are stroller-friendly:) And OMG! That Dome of Decadence.....aaaaaaaaaah! PS Your outfits are great as always:) Perfect for travel and still stylish. haha thank you! The dome of decadence was just the best! Such a fun trip. I need to go to this aquarium someday. Love your outfits too! Looks like a fun family trip! I thought we had seen the last of the stroller but met up with Mum for a shopping day last week and Miss L was tired and sketchy . . . luckily Mum kept her stroller in the boot and we were able to bust it out for a nap even though she did look a bit ridic in it. I do miss the pram for hanging bags and shopping off it though! Yes it's so good for throwing everything in! I'm going to need to cut down on the baby bag contents so it's easier to carry once we give up the stroller! What a fabulous trip, Mica!!! I love to see the boys having fun!!! And how wonderful to see you in your maxi!! A LINDT CAFE?!! Sounds like heaven haha! Travel is never easy or light with kids and there are always lots of planning ahead involved too. LOL! Snacks are MUST when travelling with little ones, I learned that lesson the hard way. I think snacks are a must have in general with toddlers, haha! Such cuties!! YOu look lovely dear! Your boys are so cute and I adore your casual chic look! Thanks for these great tips. It was so lovely to see you! I'm glad you had a good trip overall, even if the weather wasn't the best and stroller access was bad. It's something I don't really think about but it must make things such a nightmare. I'm impressed at your light packing, especially with two little ones! Although it sounds like their were lots of difficult moments with that stroller, it seems like you still managed to have a fun holiday! We did, it was a really fun trip! There's something adorable about having the kids with you and watching them wide eyed curiosity over everything until it's time to eat. I trust you guys had a wonderful time out there and as we say in french " tu as une bonne mine"
Aww these photos are adorable!!! Despite having some unexpected issues. it seems like you and your lovely family had tons of fun. So many activities to do! The aquaium experience must have been awesome, I'd LOVE to go there. 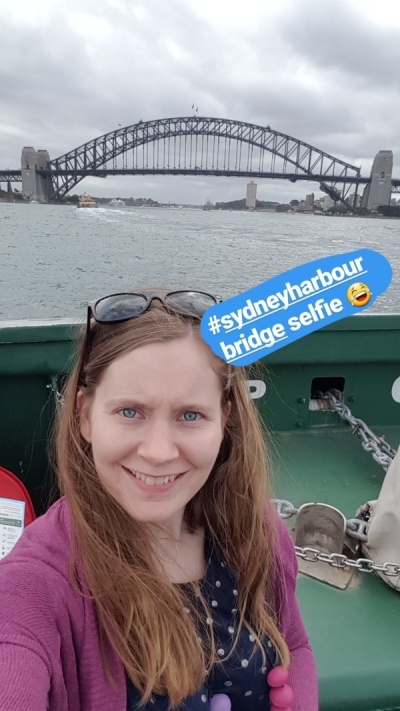 And i'd also love to take classic tourist photos like in the bridge or with the Opera House behind me <3 Such an iconic city! Thanks for sharing, lovely. Yes, I was so determined to get the classic tourist photos, haha! Glad we got them on the ferry. I've been wanting to visit Sydney! This looks like a fun time and the outfit looks comfy! How lovely is Rachel?! What a shame about the weather - but I'm pleased you still had fun. 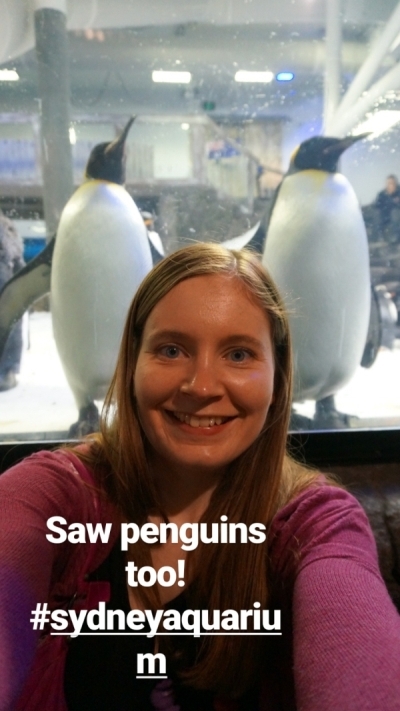 The aquarium is one of my favourites - did you see the dugongs?! 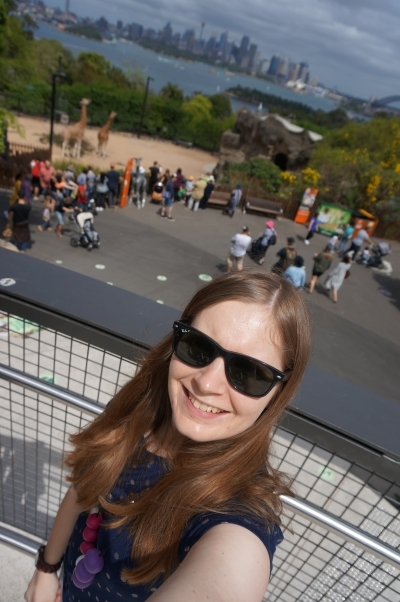 I'm not a fan of zoos per se, but the gondola ride and the views from the top at Taronga are hard to beat! And that chocolate dome! Swoon! We didn't get to see the dugongs, which is a shame as they were my favourite part! Sadly there was a toddler related bathroom emergency, haha! Sounds like you had a really fun and successful first trip with the boys! Your dome of decadence certainly caught my eye! Yum! I can't imagine how you can baby wear and carry your large crossbody bag - my shoulder starts aching after a while just carrying a medium sized bag. The speedy is super light which helps! And I try not to over fill it. It sounds like you and your family had a blast! I'm sure hauling around the stroller got tiring though--little ones always need so much STUFF!! I appreciated all your travel tips too--I still haven't done any big trips (other than a long weekend road trip) with the kids just yet, maybe one of these days. We haven't done big road trips yet (although I have one coming up) as I'm not sure how I'd keep them entertained from the front seat! This looks like an awesome trip! Packing snacks is VITAL in the world of parenting. So many things can be fixed with, "You want a snack?" So glad you had a great time! Love how you colour coordinated with the weather. Grey skirt for a grey sky. If I ever get to Australia one day, maybe we can have a bloggy meet-up! :) The Lindt Cafe looks AMAZING!! Yes! They have them in Sydney and Melbourne, so lots of choices! PS You look fab too. Oh yey, I'm Brisbane based too! :) Let me know if you come over! Fabulous post! You're making me so nostalgic for Sydney! I never did make it to the zoo, though...sounds like a good excuse to go back. Haha. Besides the trouble with the hotel and the stroller it sounds like you all had a good time! I wish I could take a short plane flight and be in Sydney haha! We did have such a good time! Thanks Anna! I felt a bit out of place sometimes - everyone is so stylish! Oh wow, that is a long way away! What an awesome trip!!! Loved that grey maxi and i wish i could have some of that Lindt Chocolate! Traveling with kids is never easy, but you can make things less stressful. Great job dear. Also, those little boys are sooo adorable! It looks like you and your family had an amazing time! When it comes to travelling I am always stressed about travelling with two little ones but from your experience, I think I need to plan a trip with my kids. All the pictures look amazing and you look so pretty. Mica, you handled everything really well. Penguins are always funny. Love the different places you guys went. Always a fan of the zoo and aquarium. Thanks all for your lovely comments - we did have a great time in Sydney!